Police Commissioner William Bratton and New York City Mayor Bill de Blasio at the New York City Police Department's Clergy All-In Conference. The conference focused on community involvement and the NYPD's counterterrorism threat assessment program. Photo Credit: Police Commissioner William Bratton and New York City Mayor Bill de Blasio at the New York City Police Department’s Clergy All-In Conference. The conference focused on community involvement and the NYPD’s counterterrorism threat assessment program. Mayor Bill de Blasio predicted Wednesday morning that 2016 would be a “very good year” in the NYPD’s efforts to drive down crime. Speaking on the radio, de Blasio acknowledged that the number of murders has risen in 2015 compared with 2014, but noted that gun arrests are up, and shootings are down, as is overall crime is down. De Blasio said that he expects the addition of 1,300 new police officers, combined with hundreds more being sent to the streets from desk jobs, would help drive down crime even more. “I actually think next year is going to be a very good year for us,” he told 1010 WINS radio’s Brigitte Quinn. There were 15 more murders as of Tuesday in 2015 compared to the previous year, when New York City enjoyed the fewest murders in 50 years. De Blasio dismissed a suggestion made a day earlier by former Police Commissioner Ray Kelly that the police force was manipulating crime statistics under his successor, de Blasio NYPD Commissioner William Bratton. 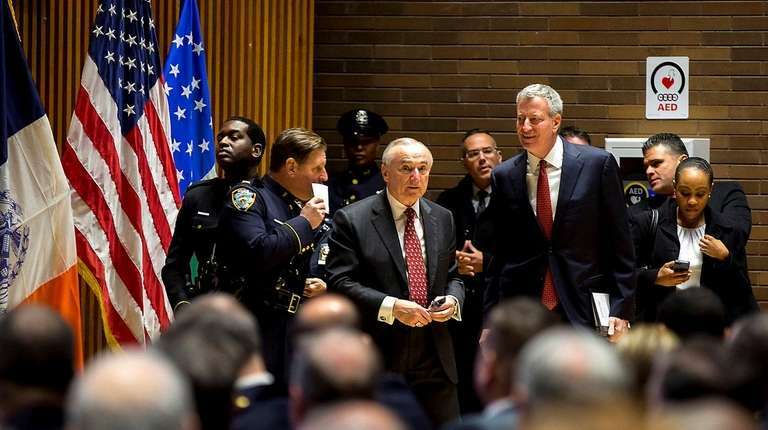 De Blasio stood by Bratton. Asked about de Blasio’s response, Kelly spokeswoman Anne Reingold said the former top cop was unavailable to comment. Matthew Chayes, a Newsday reporter since 2007, covers New York City Hall.